(15/112) TRENTON – The state’s annual black bear hunting season will begin just prior to sunrise on Monday morning, December 7, in all or portions of eight northern New Jersey counties. The season is scheduled to end 30 minutes AFTER sunset on Saturday, December 12. It may be extended by up to four days if poor weather or other conditions result in a reduced harvest, a new condition added to the statewide Comprehensive Black Bear Management Policy adopted this year. The season runs concurrently with the six-day firearm deer hunting season. While black bears have been reported in all 21 counties, the densest population – estimated at about 3,500 – is found in northern New Jersey. Effective this year in the updated Comprehensive Black Bear Management Policy, the current zones in which bear hunting is permitted has expanded to all of Hunterdon and Morris counties, a small additional portion of Passaic County and, for the first time, a small portion of Mercer County. 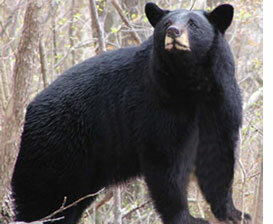 Bear hunting has also been extended to all of Somerset County, with the exception of Franklin Township. The updated 2015 policy was developed after extensive research and review of the five bear hunting seasons that have taken place since 2010. The Division of Fish and Wildlife determined that expanded hunting opportunities are necessary to reduce the population and to reduce conflicts with people. Research over the past five years that included surveys, captures of previously tagged bears, den studies, reproduction analyses and density analyses confirm that northwestern New Jersey continues to have a very dense black bear population and one of the most productive in the country, with larger litter sizes and high cub survival rates. The Division of Fish and Wildlife utilized studies conducted by Penn State University along with widely accepted population estimate methodologies known as the Lincoln-Petersen Index and linear regression modeling to conservatively estimate the size of the black bear population in northwestern New Jersey at 3,500, about the same as when the hunt was first approved in 2010. The population has not decreased significantly because reproduction rates, known as recruitment, have exceeded mortality from hunting and natural causes. Last year, 272 bears were harvested during the annual black bear hunt, up slightly from the 251 taken in 2013, but a large drop from the 592 harvested in 2010. The drop-off has been attributed, in part, to poor weather. In addition, the December hunt coincides with the time when bears are becoming less active and are beginning to den. The December hunt was purposely planned for this time of year to be conservative as biologists assessed the first five years of hunting. An additional six-day October hunting season begins in 2016, three days for bow hunting only and three days for bow hunting and hunting with muzzle-loading guns. The allowable per-hunter harvest increases from one bear to two bears next year, as well, provided the first bear is taken during the October bow/muzzle-loading hunt and the second is taken during the December firearm hunt. As of today, approximately 6,400 bear hunting permits have been obtained by licensed hunters from New Jersey and other states for this year’s hunt. A maximum of 11,000 permits have been allocated for this year’s hunt.